Mitchell-Innes & Nash is pleased to announce the opening of their exhibition "Arp: Line and Form" which is scheduled to run from October 12 through November 18, 2000. "Arp: Line and Form" will be a wide-reaching survey of this artist’s work and will present examples from each decade in which Arp was active. The exhibition, consisting of more than 30 works, will gather together painting, drawing, sculpture and relief from Arp’s early Dada period through to his final sculptures. The work of this uniquely imaginative and multi-disciplined artist is one of constant discovery and revelation. Not satisfied with what he was learning through his formal art training as a young man, Arp turned away from convention and went in search of new forms by looking for inspiration to the purely natural world: plants, seeds, the sky, animals and the human body. Born in 1887 in Alsace, Arp inherited two rich cultural histories- that of Germany and of France. But Arp, who wanted to break from those traditions, immersed himself in the art of his day: Cubism, the Blaue Reiter group, Surrealism. But surely Dada, the group to which he was proud to call himself a founding member, with its revolutionary, improvised, intuitive approach to art was the origin of his mature work and his great contribution to 20th Century art. Feeling completely liberated from tradition Arp began creating drawings and sculpture with unconventional materials: string and driftwood, torn paper. 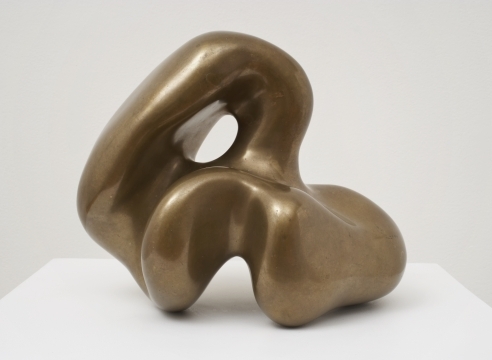 Eventually, Arp would commit himself almost entirely to sculpture meant to be viewed in the round and would come to conceive of his individual works in multiple mediums and sizes. A fully illustrated catalogue with an essay by Walburga Krupp of the Stiftung Hans Arp und Sophie Taeuber-Arp, Rolandseck will accompany the exhibition and will be available through the Gallery. An opening night reception will take place at Mitchell-Innes & Nash on Wednesday, October 11 from 6 to 8 pm. This exhibition is presented in collaboration with de Pury & Luxembourg Art, Geneva. For further information or transparencies please contact Robert Grosman of Mitchell-Innes & Nash at robert@miandn.com.